This product fully integrates with TaskTrak Professional, providing you with an interface for your clients to access and view task information, which can be added, viewed and queried. 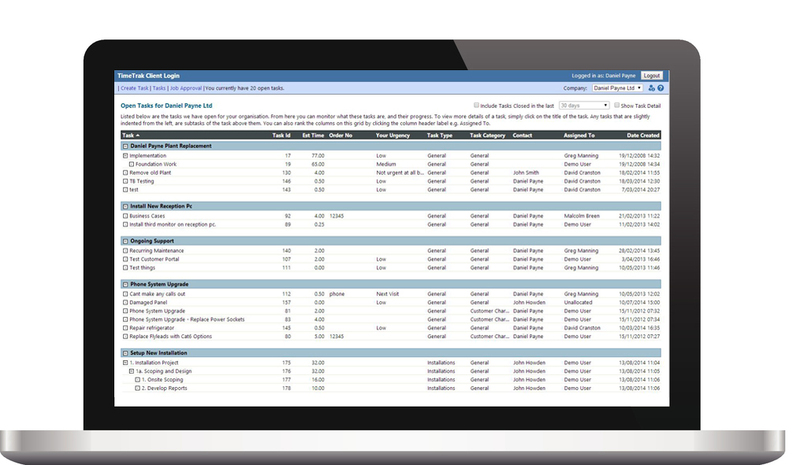 TaskTrak Client Task Module offers you the flexibility of giving different customer types different visibility rules.This module allows your customers to review, query, close, create and attach information to jobs, reducing the amount of time and frustration caused. They are also able to create and enquire about tasks through this platform. You'll impress clients and improve relationships by allowing clients to log in to view their jobs and giving them visibility of what is happening. This portal can be tailored to suit the needs of each customer type with visibility or access rules; this allows different customer types to view different levels of information. Let your clients help you, to help them. Customers are able to log on to the Customer Portal to create, view, attach items to, or enquire about tasks.